This feature story was published in the weekly food issue of the G section on May 3, 2012. I interviewed the organizer of Eat Boston, an event company that plans foodie events for charity. I attended his biggest fundraiser of the year, the annual Bacon and Beer Festival. I also took photos for a gallery I created for Boston.com and wrote a preview post for the Go To It events blog before tickets went on sale. 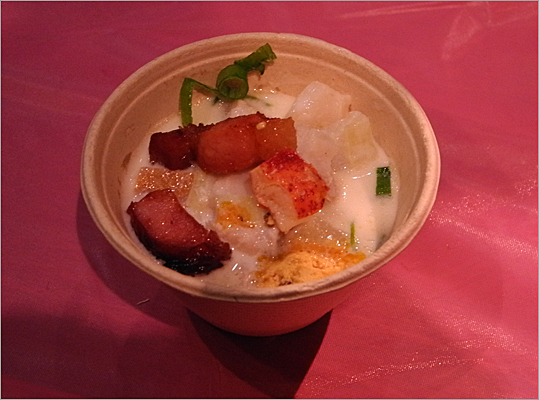 Smoked cod and lobster chowder with chili lime butter and bacon lardon from Chez Henri, a French-Latin fusion restaurant in Cambridge.